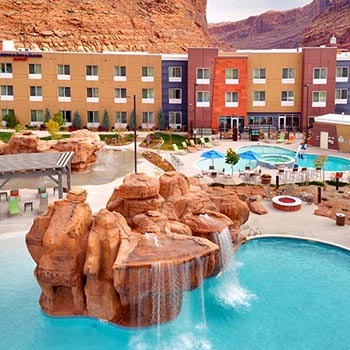 The first two nights of a Moab Utah Vacation Sampler Trip are spent in the luxury and comforts of the SpringHill Suites by Marriott. The location is quiet, and away from the hum of downtown Moab, while still just minutes away from town. Plenty of room in the living area, a spacious lobby and pool area make it a perfect place to regroup between adventures. The breakfast area is spacious and serves up a great spread for a day of activity and exploration. The Moab Marriott is located almost as close to the entrance to Arches National Park as it is to downtown Moab. Perfect! The pool, waterfalls, cozy fireplace settings, and hot tubs are perfect for refreshing between adventures in and around Moab, Utah. The Rooms & Suites are more than just a bed and bathroom. Enjoy the living space. A smart breakfast in a spacious eating area with overflow to an outdoor patio makes a great start to a day of adventure. Southwest Sampler is the perfect trip for someone who has a short amount of time and wants to see the best things Moab, Utah has to offer. Plan for two dinners at your own discretion during the Sampler package vacation. Keep in mind the mini-fridge and microwave in your room if you want to "eat in". A delightful variety of unique eateries are available in the little town of Moab, Utah. There are some franchises you may be used to, but download our "Moab Insider's Guide" to get the best scoop. (All meals will be provided on the river portion of your Moab, Utah Vacation Sampler). Plan to eat the complimentary breakfast at the SpringHill Suites. They offer friendly service along with a good variety of quality breakfast foods to start your day. After your Arches Tour, you will be treated to a lunch at the Marriott, making it convenient for hitting the pool or relaxing before the next adventure. Grab dinner after check-in the first night. On the second night, you will need to plan ahead to schedule dinner before departing for the Sunset Hummer Safari, which departs right at about typical dinner time.